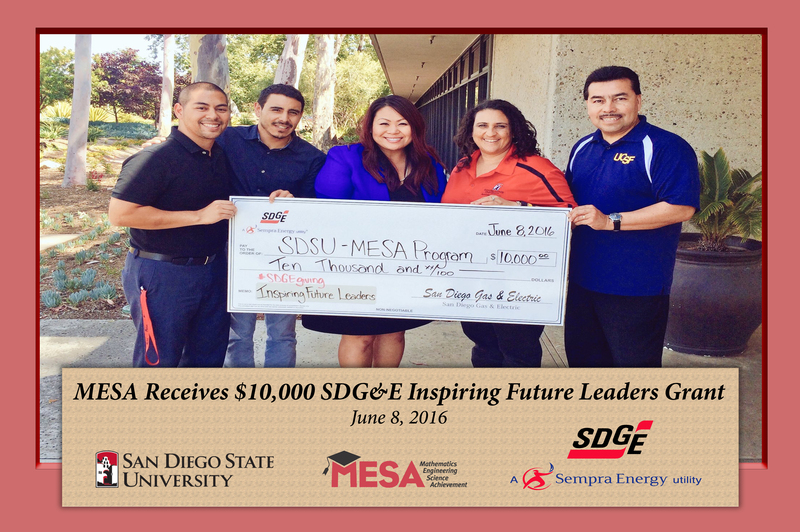 The San Diego State University Mathematics Engineering Science Achievement (MESA) program was the recipient of a $10,000 San Diego Gas & Electric (SDG&E) Inspiring Future Leaders grant on June 8, 2016. The grant will support MESA’s new Innovate Academy, a mobile 3D printer experience. MESA Innovate Academy will be a train-the-trainer academy for understanding what 3D printing is and how it relates to Science, Technology, Engineering, and Mathematics (STEM) fields and careers. MESA Innovate Academy will use a ‘Learn, Do, Teach’ approach, allowing MESA undergraduates, who will be trained on 3D printing, to expose this technology to various middle and high schools sites throughout San Diego County. “Students from underserved communities have limited access to new technologies. With SDG&E’s support, MESA can provide access to 3D printing technology throughout the MESA pipeline” said MESA Program Director Natasha Forbes-Celise. MESA is one of the largest programs in the state to support educationally disadvantaged students so they can graduate from college with science, technology, engineering, and math (STEM) degrees. MESA provides academic support and enrichment to more than 18,000 K-12 students and more than 7,800 community college and 4-year college students each year. SDG&E is a regulated public utility that provides safe and reliable energy service to 3.5 million consumers through 1.4 million electric meters and 881,000 natural gas meters in San Diego and southern Orange counties. The utility’s area spans 4,100 square miles. SDG&E is committed to creating ways to help customers save energy and money every day. SDG&E is a subsidiary of Sempra Energy (NYSE: SRE), a Fortune 500 energy services holding company based in San Diego.